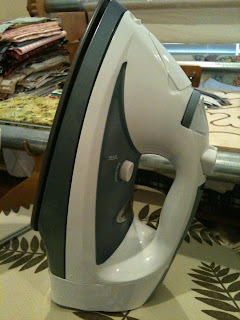 Sarcastic Quilter: What iron do you use? Me: "While we are out, I want to pick up a second ironing board." Me: "So you can iron your uniforms in the bedroom and not in my sewing room. So there aren't hangers and tags laying around." Hubs: "Oh, okay. Then I need an iron." Me: "No, we have one from when we were in our other home that you bought, remember?" Hubs: "No but that's fine. You can have that one and I'll take the one in your sewing room." Me: "What? Why? No you are not." Hubs: "But I love that iron. It glides so smoothly. It works great." Me: "I know. 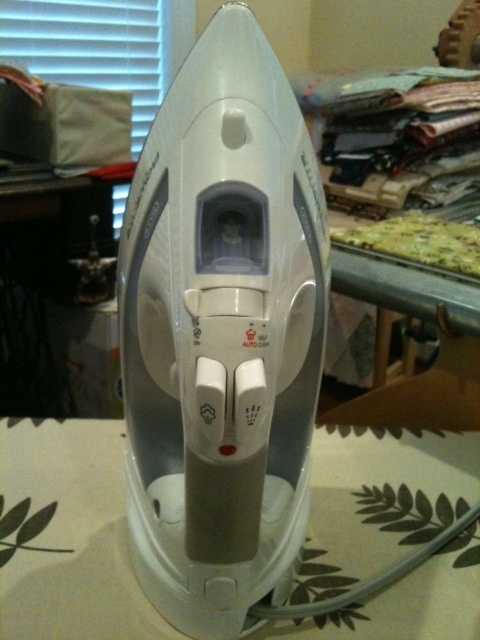 I spent more money than I ever spent on an iron to get one that would be jsut want I want for quilting." Hubs: "Then let's buy another." Me: "Try the one you bought last year first." Hubs: "I'll give it a try." Later at home, I'm sewing away and in comes hubs. He unplugs my hot and in use iron and plugs in the one he "loved" last year. Hubs (taking my iron): "This one is better." Me: "Well then I'm buying a new one." Hubs goes back upstairs to iron his unifor and I try to press 1, JUST ONE, lousy seam open and I turned his iron off. Unplugged it and hollered to hubs. "Bring that downstairs when you are done, please." He laughs, "See? I told you it was bad." 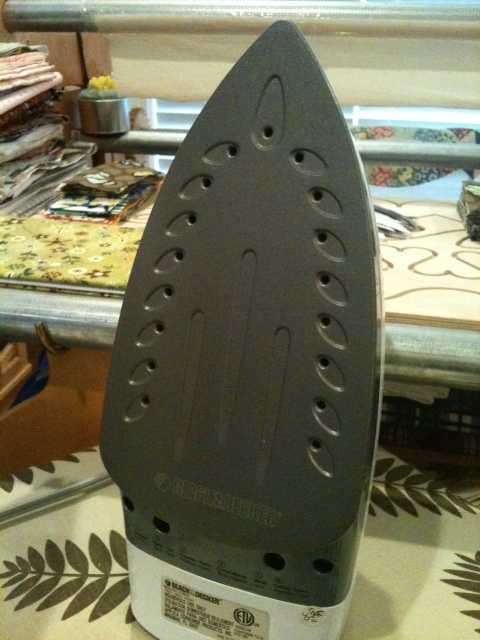 What's so great about my iron and what's so bad about hubs' iron? Well, nothing really. They both function and function well. I'm sure are many of you with many different types of irons so let me preface the following by telling you that this post is only about MY personal preference. Here are the irons in question. 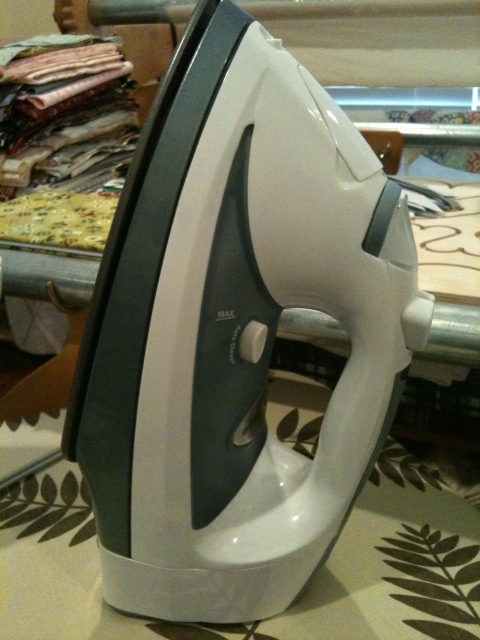 Primarily the thing hubs and I love the most about the first iron is the surface on the iron that touches the fabric. The second one is a bit more like teflon and doesn't glide over fabric with only the slightest pressure. You have to use more pressure with hubs' iron & frankly, for me and my seams, I have to pay more attention to the way I press the seams. On mine I also like the slightly less bulky point and the extra steam holes (for wehn I do want to steam). 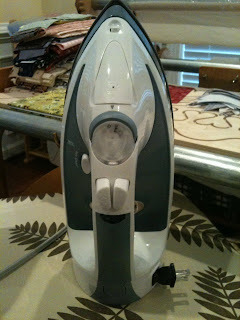 The hubs' is good for steaming a hanging garment (which is one of the reasons hubs liked it to begin with). So, it now looks like I'm in the market for a new iron. I can buy another Rowenta and I probably will but part of me wonders about those Olisios I've seen out there or maybe one of you has something else you would recommend. Do you? What do you use and do you love it? 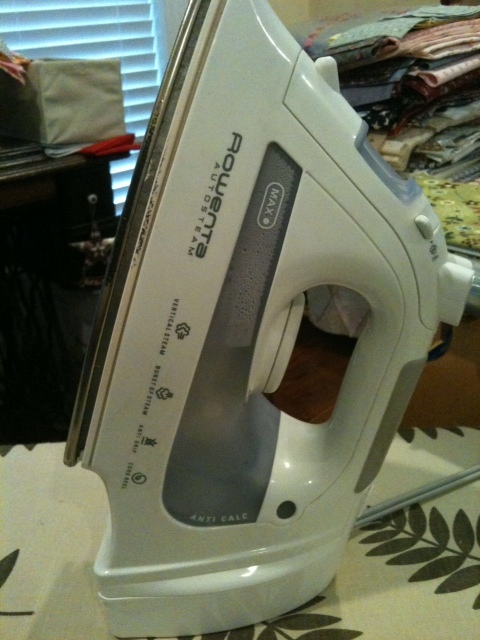 I have a Rowenta just like yours, and it has been a great iron. I would probably buy another one if it dies. I have a friend that has the Olisio, and she loves it. 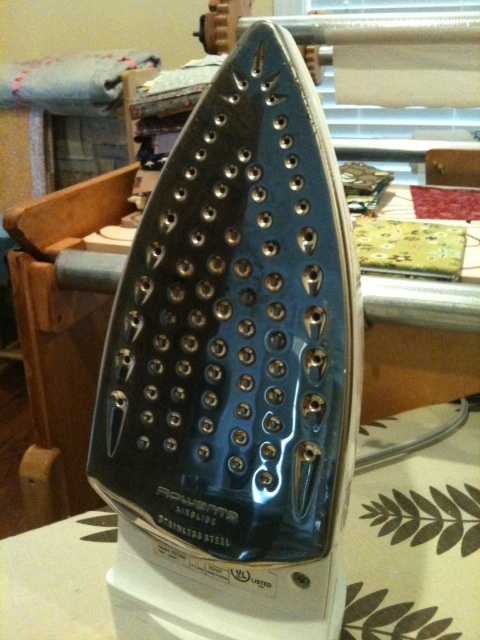 I used it once, and it did iron very good. Maybe someone will come along that can tell you more. I have a Rowenta that is nearly 10 years old. And it's on it's last leg... So I can't offer an opinion on a new one, but will be watching the comments intently, and then waiting to see what you get! 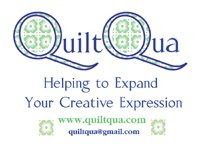 I've also wondered about the Olisio's and with the quilt show next month, I know they'll be there as a vendor. Almost 100% of the time...I leave and come back to iron and have to stand and wait for it to heat up...just to iron for a minute or two. Okay...sorry...I'll crawl down off of my soap box now. I wish I had a nice iron like yours, I just have a cheap iron, well two cheap irons. I have to say that I love my Rowenta too. I've looked at the Olisio but I just don't want to spend that much. I spent the bucks & got a Rowenta-the second time I put water in it is started to spit & leak. I gave it to my cousin (she never uses steam) & went & bought myself a T-Fal Ultraglide and I love it. It does shut itself off, but takes like 10 seconds to heat back up again. I had a Rowenta that someone abused and then abandoned at Goodwill. I never understood why people were willing to spend so much on an iron until I had her! I was able to get a year or more of use out of her, not bad for $4.99! But then I just couldn't go back to and old yucky iron. Rowentas were still out of my price range. So I started researching. I came across a Shark that had all the features of mya Rowenta, the only difference, slightly less power. Half .the. Price! I have to say I can't tell a difference in the power. My Shark steams away,NAND seems to be every bit hot enough to handle quilting. I use a Panasonic cordless and will NEVER EVER had an iron with a cord again! I LOVE it. I've used Rowenta's and they are soooooo heavy that they hurt my wrists. And every single person I know who have one has problems with them leaking water and spitting etc. The new Panasonic has two pointy ends, I want it, and will probably buy it some time this year. I have the yellow Oliso. It took some getting used to (leaving it face down), which once you do get used to, is hard to not do with another iron in a class :(. I did find that it spit, and for Christmas the hubs got me the orange Reliable. I've only used it a couple times so far, the jury is still out on that one, but I did like the ironing results when I used it on some applique work.